The inviting open-plan layout of this tropical villa provides a calming, relaxed feel from the moment you enter. The entrance foyer flows into an impressive living/dining room that is framed by coral stone pillars and leads on to an expansive verandah. Taking full advantage of the spectacular Caribbean sunlight and magnificent views, the ground floor level also offers an entertainment terrace with a wet bar and gazebo, a family/media room, kitchen, plus a laundry and fitness room. Three gorgeous, plush guest suites also open on to the ground floor verandah, where stunning, unobstructed sea views over the swimming pool can be enjoyed. The alluring décor of the elegant master suite that encompasses the entire first floor makes it the perfect place to unwind. This suite includes a sitting room, private balcony and a luxury bathroom with a dressing area. The large, air-conditioned kitchen is fully-equipped with modern appliances and features granite countertops with an island in the centre. The property is complete with an extensive security system, a games room (including an entertainment system and exercise equipment). The Great House is a unique luxury vacation villa rental, offering a level of luxury and personal service unmatched by none. 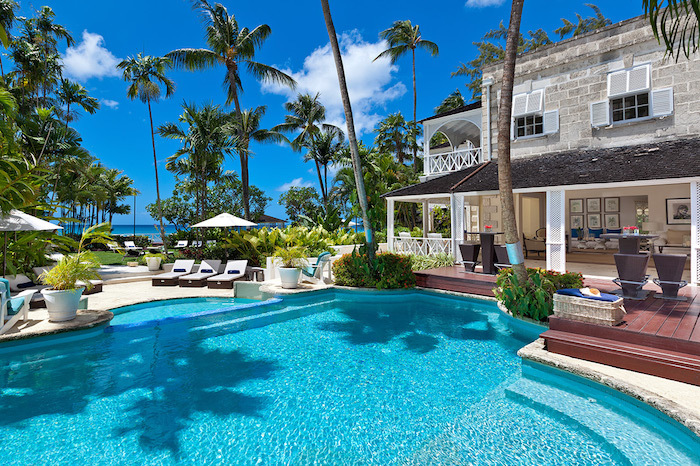 This hidden gem is tucked away on the beach within 1.5 acres of beautifully landscaped gardens, offering guests complete relaxation and privacy; the epitome of gracious living.